The proper technique for any project is the secret to achieving success. This includes activities that you do for fun or as a DIY project. Some people like to work with wood and others will like to garden. If an area of land is not available for a garden, then a few alternatives are available. You can grow many types of plants at home. This includes the ability to grow nectarines from seeds. Simply planting seeds in the ground is not sufficient to grow nectarines. The reason is the conditions that are necessary for nectarines to grow may not be sufficient in your area. This means you need to find a few other ways to get nectarines to grow. Many seeds you can plant at home need to germinate and will mean the seasons of the year may play a factor. You will need to get your seed started for you to grow nectarines at home. The best option is to chill an assortment of seeds in a refrigerator. You can also leave them in a cold garage throughout the winter. A can or jar of dirt is all that is needed to start your seeds to get a sprout to grow nectarines. Being able to grow nectarines at home will require a supply of seeds. You can typically obtain a supply of nectarine seeds at a local market that sells fresh fruit and produce. Another option is to find a good place for suitable seeds online. The next step is to find containers to plant the seeds once they have sprouted. 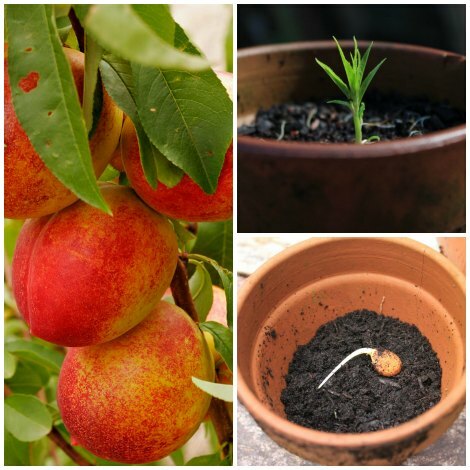 Pots made of ceramic or plastic are a great option for containers to grow nectarines. If you do not want to purchase any containers, then five-gallon buckets will work just as well.